Famine in Ethiopia: Due to bad weather or policy Failure? Here we are now, after twenty four years of power monopoly by the EPRDF regime and five years later after the implementation of the so-called Growth and Transformation Plan, more than 11.3 million Ethiopians have nothing to eat let alone to choose what to eat. Arsi, Hararghe, Afar, Borena and Somali are the hardest hit areas of the latest famine in the country. 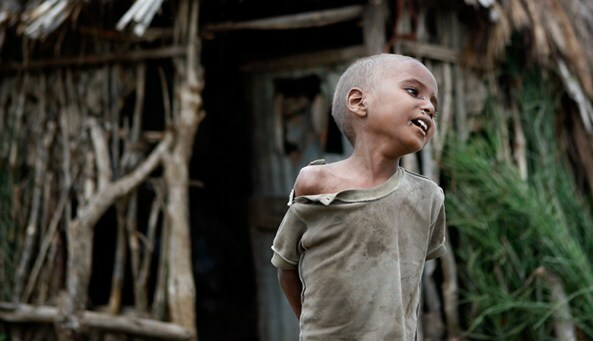 Children are dying in the hands of their parents and suffering from famine related diseases. Nevertheless, the EPRDF regime has been blaming on bad weather particularly the El Niño for the recent brutal famine. Even if the El Niño is partly attributed for drought in general, the famine we are witnessing toady, in Ethiopia is not the result of seasonal crop failure due to bad weather or natural calamity as the EPRDF regime would like us to believe. As a matter of fact, drought, climate variability and other natural calamities occur not only in Ethiopia, but also in any part of the world. However, drought does not necessarily result in famine. This implies that droughts are a normal component of Ethiopian life making famines inevitable unless the proper preventive measures are adopted. Hence, in examining the current famine in Ethiopia, I will stress the structural links between food shortage and the lack of good governance in general and the failure of policies and strategies in particular. Fifty years ago, famine was simply understood as the result of food shortage due to seasonal crop failure or natural disasters. At that time, it was not difficult to understand the reasons for famine when poor technology and static economic systems hampered human beings from getting access to food, especially in the face of regional natural disasters. But today, natural forces and other climatic conditions cannot be responsible for famine causation as was the dominant mode of thinking five decades ago. So that it is logical to ask why famine is persist in Ethiopia in the ear of global surplus, high-technology early warning systems and “vibrant economic growth” in the country. Answering this question requires looking beyond technical factors, towards political explanations. This means that the real causes of famine in Ethiopia deeply rooted in the country’s history of civil war and repression. Therefore, analysis of the past and present famines in Ethiopia should focus on root causes of the problem, instead of seasonal symptoms. Currently, Ethiopia has faced the world’s gravest hunger problems and these problems are getting worse in the coming few months. As it was mentioned above, more than 11.3 million people are in need of urgent food aid. There is no doubt the failure of policies and strategies are causes of the recent famine. For instance, the Agricultural Development Led Industrialization (ADLI) strategy of the EPRDF regime was formulated to keep 84 percent of the population in Ethiopia to live in rural areas and heavily depend on the natural environment for food production, animal husbandry, forestry, water and fuel. Keeping people in rural areas in which land belongs to the state and can’t be sold is one of the mechanisms of the regime to marginalize the majority of the population from political involvement and to prevent urban unrest. Consequently, the sizes of agricultural lands are diminishing from 0.5 hectare to 0.2 hectare per house hold due to high population pressure. This means that too small farmlands are passed down to the generations, which can’t provide enough food for the families that work on it even with normal rainfall conditions. In addition to the population pressure put on farmlands, there is a large-scale land acquisition for floriculture and biofuel production. According to the Ministry of Water and Energy (MoWE2014), the Ethiopian government has allocated 23.3 million hectares of land (equivalent to 20 percent of the whole country), for biofuel production alone. These ambitions were intended to position Ethiopia as a leader in Africa, in the emerging push for biofuels to provide energy security for the rest of the world. However, the growing demand and support for biofuels in the United States and the European Union, has increased the competition for land that impacted food security in the country. A study conducted by Lester R. Brown in 2013 reported that between 1980 and 2005, the amount of grain used to produce fuel ethanol in the United States gradually expanded from 1 million to 41 million tons. This is an alarming call not only for Ethiopia but also for the rest of the world to stop the crime against humanity. To add further insult to injury, all agricultural inputs and outputs in Ethiopia are highly regulated and manipulated by the party-associated enterprises called EFFORT. EFFORT stands for the Endowment Found for the Rehabitation of Tigray and established in 1995 by the TPLF. Their activities ranged from agriculture to trade, textile, livestock, mining, transport and to the financial sector. Members of the party manage the fund. This dominancy in the private sector especially party-owned enterprise has made the emergency of new private entrepreneur close to impossible. Furthermore, the Midroc business empire owned by Sheik Mohammed Alamoudi accounted for 70 percent of the so-called foreign investment and displaced millions of small farmers from their livelihood to leave them hungry. Therefore, attributing the current famine directly to climate change is impossible. Because, extreme climate events such as El Nino may be an immediate trigger of famine but cannot be a root cause for it. In the Ethiopian context, famine is a prolonged and preventable geographical phenomenon caused by the lack of good governance in general and failure of policies and strategies in particular. Among the many coping mechanisms, mobility from region to region or from one sector to another sector is crucial to prevent persistent famine in Ethiopia. A number of scholars agreed that genuine democracy and political institutions are the critical factors in the struggle against famine. A free and independent media on which freedom of expression might depend on also plays another crucial informative role by providing information on the symptoms of the crisis both to individuals and to political parties. Furthermore, news media can put direct pressure on the government and other actors in charge of taking action. But sadly enough, the regime in Ethiopia don’t have the political willingness for such kind of genuine democracy. So that, we must stand together to struggle for total regime change from top to bottom. We must eliminate officials of the dictatorial and corrupted regime of EPRDF and make them accountable for the crime they have committed against humanity in the name of development. Down with dictators! Ethiopia shall be free!